Is it defined somewhere what data is sent from your cs-cart store to their server? Where would I look for that? Could "calling home" like this potentially slow down the site? I've gone from a GTMetrix AA to BA since installing this theme; but probably that has more to do with the graphic intensity of the page than anything else. in general : if software calls home it can potentially access any data in the database without any control or notice by you. it's solely a matter of trust. because it's a matter of trust, it's important that the method is described. calling home can slow down your site depending on how it's done. But it is speculation to think this is the cause of the slowness of your site. You should inspect the problem or have it examined. P-Pharma, if the default methods to make http requests are used by their add-ons, you can find the request details on the Administration -> Logs pages (select Advanced search -> Type/Action -> Requests). Let's bring some light here. First off, please note that our license add-on was implemented solely for anti-piracy reasons and to prevent unauthorized use of our products. Although we want to be as transparent as we can, we cannot fully expose our code regarding this issue as this is part of our product anti-piracy protection. However, if you know how to read the code, you can verify that the theme licensing addon was built according to CS-Cart standards as described in the documentation found here http://docs.cs-cart...._licensing.html with slight modifications in order to work with CS-Cart version 4 and to verify theme license instead of add-on license. All the data sent for license verification is therefore according to CS-Cart standards as described in this documentation. We have already suggested CS-Cart to develop built-in theme license support. When and if CS-Cart implements this feature, we will gladly use it instead. I am all for anti-piracy measures, but I am not going to buy software that calls home. Once their server goes down, gues what happens to your site. Thats way too dangerous. If you are using CS-Cart, you are already using a software that calls home. Recently I encountered a reputable addon developer who included call backs in their addons with very extensive information from my database sent to their server. While that's probably not the case here, I think that if an addon calls home, then it should be clearly described what information is transferred and how the information is stored and secured on their server. The only data that is stored on our severs is the one you fill out when purchasing a theme for a storefront URL. The verification is done only using that data. Rest assured that no other information is taken. We’re only interested to know that you are using our theme in good faith, and you follow the agreement of using our theme only for the URL you declared/registered during your purchase. The "calling home" (license addon) does not have anything to do with your storefront as it is related exclusively to your admin part. Also, license verification only happens once, in the moment you login to the admin, and it only takes less than 1 second for the license to be verified. So it’s not like license verification happening all day long, every minute, every second. Therefore, it has nothing to do with your site speed. Energo: could you explain what data is sent from the admin to your server? Does this mean that the cs-cart installation stops working if your server is unreachable? We have already answered this question. See the answer above. The CS-Cart installation is never affected by our addons as we do not modify any of the core files. Your CS-Cart installation will always work no matter what. In case you are referring to the theme, then you have to keep in mind how unlikely this is as our servers have 99.9% uptime. So you will have to try to verify the license exactly in the moment the 0.1% downtime happens and the main servers, along with the backup servers, are unreachable. Even if that happens, the theme will continue working for some time and the servers will be reachable by then. The only time when theme can stop working is if we de-activate your license on purpose (i.e. violating our terms). No license de-activation happens without informing you initially, thus allowing you to correct any licensing issues. Yes, I am referring to the theme, because the theme is a vital part of a store. If it would stop working in case anything happens with energothemes or its server over time then that would be a problem. I am sure you have splendid up time for your servers and as there is a time delay its not an immediate risk. However, I have been using third party add-ons for over a decade now on various software platforms. There have been many instances where an addon provider vanished or had to close shop due to circumstance. Some had similar call home functions and as a result vital parts of websites stopped working. So I hope you can understand where I am coming from. Thank you for explaining this risk. I appreciate that you are solely trying to verify that clients use your work in good faith. But a software pirate will just remove the call back from the code while legitimate customers are the only ones burdened by it. You create very nice looking themes. Its obvious a lot of work has gone into it. Does your custom work come without call home functionality? First off, we’d like to thank you for your appreciation and for your kind words regarding our work. Yes, there has been a lot, a lot of hard work in our theme. We do not release new products very often, simply because we aim to create very good quality products. Our philosophy is that instead of creating say 10 medium quality products, to create only one, but that one to be top quality. Generally speaking, developing an add-on or a theme requires a certain amount of time and work spent. The more complexity involved in creating them, the more time, work and knowledge/experience are required. When you really care about your products and the passion you have for what you’re doing, afterwards, when you see your hard work illegally shared on different sites, then you really have a bad taste in your mouth. Therefore, you need to come up with a solution to prevent this. And, so far, it seems that the “calling back” is one of the best solutions simply just to make sure all of our clients are using our products in good faith. Therefore, we have throughly studied the CS-Cart code, learned from it, and came up with this protection tool. Regarding our servers up/downtime, you should be more concerned about your own server going down because, as we explained above, the add-on is built in such way not to affect your site in case it happens for you login to your admin panel (when the license is getting verified) exactly in the moment our server’s 0.1% downtime happens. However, we perfectly understand your concerns, we understand the issues you had with the other developers. Obviously, nobody in this world can guarantee you they will be in the business in the next day, as sometimes this depends on third party factors, economical factors, business factors, etc. All we can say is this: our products are very well appreciated by our clients, thus every day we are more and more determined to perform even better. So, we do not plan nor even think of "vanishing", don’t worry . But, in case we ever need to shut our business down due to a third party reason like mentioned above, rest assured that we’ll give you all the necessary instructions on how to de-activate the “callback”. Regarding the pirate issue you mentioned: if you put it this way, then yes, you are correct. However, he is illegally using a software on his own risk and receives no support from the theme/addon developer. But, good faith clients do not risk anything, as explained above, and receive support from the developer as well. We believe that if you have a serious business, you cannot afford working with a pirated software. Besides this, a business using a pirated theme is definitely not a serious one. Finally, the only question is: would you prefer risking by illegally using a software, or would you prefer zero risk, as we explained above? (we'r not talking about you personally, this is a general question). Theme does not come without the call back functionality, that means eliminating the anti-piracy protection. Again, CS-Cart itself is a software that calls back home. But, in case we ever need to shut our business down due to a third party reason like mentioned above, rest assured that we’ll give you all the necessary instructions on how to de-activate the “callback”. Exactly. A serious business will not use a pirated theme anyway. Any serious business will pay for quality. Script kiddies will use pirated software. I doubt that developers will really loose business over that. There is no way to stop that anyway. I firmly believe in paying for quality. Only this way there will be more quality and the cs-cart marketplace will grow because of it. Pirated software is full of exploits and safety issues. My websites are the online presentation of my brick and mortar companies. Using pirated software would be bad for company reputation. We mostly create our own PSD's in house and contract external developers code these as CS-Cart designs. I have sent an email about this to office@energothemes.com some time ago but have received no reply. i like this a lot. really very nice about themes. We always answer emails as well as all of our support tickets. Sometimes, it is possible that our replies would go into your spam folder or be rejected by your spam filters. If you have not received any replies from us, please check your Spam folder as well, and mark our emails as "Not Spam" so that we avoid any miscommunication. Alternatively, you may add our emails to your address book. Being quite offtopic, please use the contact form from our site to help us identify your message: when did you send it and what was the email address your message came from. Or, you may simply send the same message again. This is a great theme. I really like it. I think it's made my site look much better and more engaging. The theme is easy to install and the instructions are very clear. The support is also very good. The price is very good. You get a lot of coding for your money. I consider this theme to be well worth the purchase price. One thing I'd like to see improved is the usability of the mobile version of the theme. I've commented on this in another thread on this forum, but wanted to repeat it here for those not following that thread (apologies to those who are). The mobile version needs the top of the page to be much more condensed. As you can see on the attached screenshot, The "My Account" button takes WAY TOO MUCH critical space, as do the four "Main Menu" buttons (Help & FAQ, Free Shipping, etc.). Basically, a person has to scroll down two or more screen lengths before they get to the content they were wanting to see. This should not be. Compare Amazon's mobile view of the same product and you will see that the content is right right there. Amazon has reduced the search and "my cart" entities to small icons in the top right, and then the product is right there. There's just too much clutter at the top of the mobile version. When a person performs a search on the home page, for example, nothing appears to happen. This can lead to confusion. The person is still looking at "All Departments,", the big "My Account" button, etc. They have to scroll down two screen lengths to see their search results. Will they scroll down? Or will they just think your site is not working? Hmmm. So, to sum up: great theme at a great price, but the mobile version needs serious work. Thank you for your appreciation and we’re glad you like our theme. Regarding your suggestion about the mobile version adjustments, we’re seriously taking it into consideration and we’ll analyze all possibilities for decreasing the distance between header and content on all pages, not only on the product page. However, when we build a mobile version of a store, there are more navigation issues to consider, like how do you navigate the categories, how do you return to the category that the product is part of if you get to the product page via a link and want to see other products, etc... Amazon is very minimalistic to the point that is missing proper shop navigation. CS-Cart also has both multi language and multi currency dropdowns that need to be displayed. Also keep in mind that this is a template (not a custom shop), designed to fit with most of the people’s needs. Therefore, when we build a theme, we need to take into consideration all possible cases and client needs and come with a solution/product to fit with most of them. Even if we do so, a theme will never fit with everybody’s taste, it’s impossible. That is why, when you buy a template, you should buy it either because it is exactly what you’re looking for, or you should take it as a starting point (thus saving a good amount of money)for further customizing it according to your own needs (target audience, type of products sold, design adjustments etc). General theme adjustments or additional functionalities may be implemented after studying the feedback received from our clients, or according to our own ideas. Anyway, at this very moment we are concentrating on making our themes compatible with the latest CS-Cart version 4.2.3 as this is what everybody’s waiting for at first. Once we’re done, we’ll be looking at the suggested design adjustments for mobiles and will definitely come up with some changes. Meanwhile, please feel free to submit your ideas/suggestions on our site. Thank you! Yeah I agreed on the mobile version needing to be more condensed at the top and maybe an auto scroll down when you go through to a category or product. Also on a mobile, scrolling can be a pain over product photos as it thinks you want to zoom around and look at it rather than scroll past so would be good if this could be disabled and click to enlarge somehow. Yes great theme. One other problem I seem to be encountering is that people are not able to check out with PayPal some of the time. I've not had a problem with this before, so I'm guessing it has something to do with this theme. A little annoying for customers who want to pay that way. 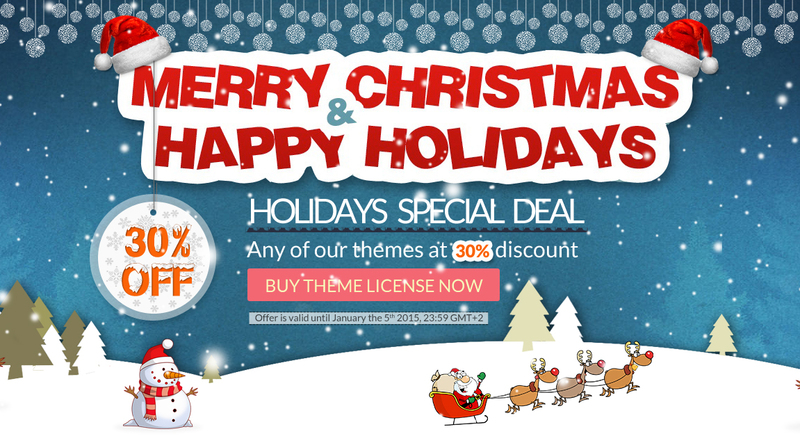 Since we are in the Holidays Season, we'd like to express our gratitude to all of you by offering a 30% discount on any of our theme licenses. We'd like to thank all of our customers for being with us in 2014 and wish everybody Happy Holidays and a Happy New Year!